Gilt Vellum Binding with the Papal Coat of Arms [Tagliaferri, Johannes Baptista]. Manuscript on paper, in Latin. “De executiva et inspectiva ecclesiae potestatibus disputatio.” [Rome? : ca. 1831–44?]. Folio (32 cm; 12.5"). ff., 371 pp.  Gregory XVI (pope, 1831–46) was a fervent ultramontanist and so sought to strengthen the papal prerogatives and powers, and through them the religious and political authority of his papacy. This manuscript on the executive and investigative powers of the Church, a topic dear to his heart, dovetails nicely with ultramontanism and was dedicated to him. Signed by Tagliaferri at the end of the dedication, it is written in a single easy-to-read hand on a single stock of high quality wove paper with a watermark bearing the date of 1822. An extended text apparently unpublished, at least separately. Provenance: Gilt supra-libros of Pope Gregory XVI. Circa 1930 acquired by John Howell, bookseller in San Francisco, and added to his personal library (bookplate on front pastedown). He later sold it to the Pacific School of Religion (bookplate on front pastedown; stamps). Binding: Full vellum over boards, round spine, no raised bands; spine richly gilt using a variety of tools. Papal coat of arms in the center of each board. All edges gilt. Jerusalem Delivered; the Elizabethan English Translation Tasso, Torquato. Godfrey of Boulogne: or The recoverie of Ierusalem. London: John Bill, 1624. Folio (27.9 cm, 11"). Frontis., , [390 of 392] pp. (81/82 excised and replaced in facsimile).  This influential translation of Tasso's La Gerusalemme liberata “done into English Heroicall verse” by Edward Fairfax (ca. 1580–1635) was much lauded in its day. The epic romance tells a fantastical version of a First Crusade battle between Christians and Muslims over the city of Jerusalem, involving woman warrior Clorinda as well as the titular Godfrey and assorted knights, lovers, witches and mermaids, etc. Fairfax's rather freely interpreted rendition, which Graesse describes as the best translation of Tasso ever done in any language to that point, was the first complete English translation of the work, and was originally published in 1600. It appears here in its second edition, with the frontispiece portrait of Godfrey — not found in all copies — and with an ornate woodcut title-page border incorporating grapevines as well as cherubs and architectural elements. Provenance: Title-page with early inked inscription: “Phill Wenman”; first page of “The Life of Godfrey of Boulogne” with early inked inscription: “Phi. Wenman his Booke.” Frontispiece verso, title-page, and one other page rubber-stamped by the Holbrook Library of the Pacific School of Religion (properly deaccessioned). Evidence of readership: Intermittent, generally unobtrusive early inked marginal brackets and marks of emphasis, with one annotation reading simply “Milton” (at “Swift from my selfe I run, my selfe I feare, / Yet still my hell within my selfe I beare”). “You Shall Soon Know What Great Travellers See” Taylor, Isaac. Scenes in Europe, for the amusement and instruction of little tarry-at-home travellers. London: Pr. for J. Harris, 1819. 12mo (16.5 cm, 6.5"). vii, , 93, [3 (adv.)] pp. ; fold. col. map, 28 col. plts.  The Rev. Isaac Taylor (1759–1829) was, in addition to being a non-conformist preacher, an engraver as his father had been; he and his sisters Anne and Jane were all writers and producers of children's books, with Isaac's “Scenes in . . .” series becoming popular enough that each entry went through a number of printings. Present here is the second edition of the European Scenes, featuring prose and poetry as we make our way from England to Norway, Russia, Greece, Italy, Poland, Germany, etc. before heading home to British soil. While the text is generally moderately tolerant of exotic (if not bizarre) foreign customs, there is a strong theme throughout that English ways are sanest and healthiest — as well as a noticeable anti-Muslim and anti-Catholic bias. The work is illustrated with an oversized, folding map of Europe and 28 hand-colored plates as well as a title-page vignette; the plates are presented in double facing spreads, with each plate showing three scenes (identified by their corresponding page number). This early edition is not widely held — WorldCat identifies only six U.S. institutions reporting copies. Provenance: Front pastedown with early, shakily inked inscription reading “My grand father John Green's book [/] Anson's grand father,” above a partially effaced bookplate reading “Anson G. [last name obscured]”; on the front free endpaper, slightly later inked inscription of Rebecca W. Green. From the children's book collection of Albert A. Howard, small booklabel (“AHA”) at rear. “They Rambled on about Soho, a Much Frequented Track” [Taylor, John]. Monsieur Tonson. A new version. Illustrated with beautiful copper-plates. Philadelphia: Morgan & Yeager, [1821–24]. 16mo (17 cm, 6.75"). pp; 12 plts., illus. 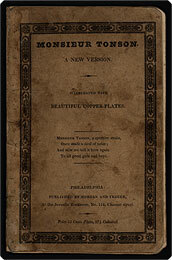 The title-page (i.e., the front wrapper) informs that the publication price was “25 cents plain, 37 1/2 coloured.” The text and illustrations are mostly printed only on one side of a leaf. Provenance: 19th-century signature of Richard H. Downing on verso of frontispice; most recently in the children's book collection of Albert A. Howard, small booklabel (“AHA”) at rear. WorldCat locates only three U.S. libraries reporting ownership (Yale, Free Library of Philadelphia, AAS). Green Banks on Either Side” Taylor, Tom; Myles Birket Foster, illus. Birket Foster's pictures of English landscape. London: Routledge, Warne, & Routledge, 1863. 4to (26.3 cm, 10.4"). [74 (2 adv.)] pp. ; 30 plts.  First edition. One of the most popular artists of his day, Myles Birket Foster (1825–99) was famed for his idealized views of rural England. For this deluxe volume 30 of Foster's most accomplished illustrations were wood-engraved by the Brothers Dalziel. Among the Foster designs here are “The Green Lane,” “The Country Inn,” “Cows in the Pool,” “The Gleaners at the Stile,” “Old Cottages,” etc. Accompanying the plates are verses by the popular playwright, biographer, and critic Tom Taylor (1817–80) — with two of the poems, “The Smithy” and “At the Brookside,” signed “L.W.T.”: Laura Wilson Taylor (née Barker), Taylor's wife. Both text and plates are on heavy paper, mounted into this substantial volume. Binding: Contemporary dark green morocco, covers framed and panelled in blind fillets surrounding central panel of fleurs-de-lis in latticework, upper corners of that panel with gilt corner fleurons, base of panel with gilt wreath (possibly of English elm leaves, referring to the “elm-branches” of the first poem in the volume); spine with gilt-stamped title, raised bands, and blind-stamped compartment decorations. Board edges with gilt-dotted roll, turn-ins with single gilt fillets defining three bands, of which the central band is brown leather rather than green; innermost edge with small gilt dentelle roll. All edges gilt; marbled paper endpapers. Provenance: Front free endpaper with garter-encircled pressure-stamp of Manchester bookseller Edwin Slater; front fly-leaf with early inked gift inscription to Ellen I. Moscrop [?] “from her sincere friend, Arabella Ble[??? ].” Most recently in the collection of Hubert Dingwall. First Edition Thackeray in Riviere Dress Thackeray, William Makepeace. The Virginians: A tale of the last century. London: Bradbury & Evans, 1858–9. 8vo (21.9 cm, 8.625"). 2 vols. I: Frontis., illus. t.-p., viii, 382 pp. ; 48 plts. II: Frontis., illus. t.-p., , viii, 376 pp. ; 22 plts.  First book edition following its issuance (1857–59) in 24 monthly fascicles. The British author's historical novel tells the tale of American-born twins who — after a lengthy period of dealing with troublesome relatives and financial issues — find themselves on opposing sides of the Revolutionary War. The work is a sequel to Thackeray's Henry Esmond. Each volume is illustrated with many plates and vignettes, all of which were drawn by the author himself. Binding: Full red morocco with gilt lettering and five raised bands to spine; four of the panels with a gilt decoration of Thackeray (wearing his small, round glasses) in a jester's costume, holding the mask and a baton. Simple double-rule gilt border along board edges and gilt dentelles to turn-ins. Top edge gilt and endpapers marbled. Signed by Riviere & Son. Provenance: On the front pastedown of each volume, a charming bookplate of Alfred and G. Ivy Clark, the former (1873–1950) being the pioneer in music recording and cinema whose work with Thomas Edison produced the first “moving pictures” having continuity and plot; he also helped Emile Berliner with the development of the gramophone, and he assembled one of the most important collections of Chinese ceramics in the West. “We May Peep Here & There into That Bygone World of the Georges” Thackeray, William Makepeace; Joseph Swain, illus. The four Georges: Sketches of manners, morals, court and town life. London: Smith, Elder & Co., 1860. 12mo (21.9 cm, 8.625"). , 20, 175–92, 257–78, 385–406 pp. ; 4 plts., illus. Performance Space in The 21st (Thames Tunnel). Description des travaux entrepris pour la construction de la Tonnelle, ou passage sous la Tamise, entre Rotherhithe et Wapping, à l'effet d'ouvrir une communication permanente entre les deux rives de ce fleuve. Londres: W. Warrington, graveur et imprimeur, 1846. Oblong 32mo (10.5 x 13.5 cm, 4.125" x 5.25"). 16 pp., 17–23 ff. ; 9 plts. (some folded); illus., plans.  Construction of the Thames Tunnel began in 1825 and was completed in 1843, giving London the distinction of having the first paved-walkway tunnel to have been successfully built under a navigable river. “[T]he tunnel proved popular. On opening day 50,000 people walked through it, and one million people (about half the population of London in 1843) visited during the first 10 weeks, all paying a penny each” (London's Science Museum Group's website). It was a great tourist attraction and the owners, The Thames Tunnel Company, were quick to capitalize on it, as demonstrated by this French-language, illustrated, informational brochure that was published by their directors (see p. ). In addition to the text, the volume has nine plates — engraved on steel by Silvester & Company — that include a “Plan of the roads & Main Objects on the Eastern Part of London as connected with the Tunnel excavated under the Thames . . . ,” a 13.5" folding cut-away view of the tunnel showing buildings on both banks of the river and dozens of ships on the waterway, and, among the several views showing men working in the unfinished tunnel, one fun end-on view with an overlay flap. Pages -23 are printed on one side only. This self-promotion of the technological ingenuity of Marc Isambard Brunelm, Thomas Cochrane, and Isambard Kingdom Brunel, the brains behind the Herculean feat, is scarce. Searches of NUC, WorldCat, and COPAC locate four U.S. (CtY, NNU, DSI, TxU), one Canadian (Toronto Public), three British (BL, OxfordU, Guildhall), and three Continental libraries reporting ownership. Angels & Allegories for Children Todd, John. The angel of the iceberg: and other stories, illustrating great moral truths. Northampton: Bridgman & Childs; New York: Sheldon & Co.; Philadelphia: E.H. Butler & Co., 1859. 8vo (17.3 cm, 6.8"). 376 pp. ; 2 plts.  First edition. This collection of edifying Christian tales includes “Niblan the Great and the Little Angel,” “The Day Lily and the Old Mahogany-Tree,” “Little Mufta and the Valley of Sorrow,” “The Island of Convicts and the Young Prince,” “The Angel of Toil and the Great Mill,” and others, along with the title story, mostly written by the pastor of the First Congregational Church in Pittsfield, Massachusetts — although he notes in the preface that some (which are unidentified) were written by one of his children. The volume opens with a steel-engraved tropical view and an additional engraved title-page done by S. Cloues. Seeing a Renaissance Man's MIND through His Letters Tolomei, Claudio. Delle lettere di M. Clavdio Tolomei libri VII. Vinegia: Presso Altobello Salicato, 1572. 8vo (16 cm, 6.25"). 296,  ff.  Emily Dickinson famously observed that “a letter always seemed to me like immortality because it is the mind alone without corporeal friend.” So it is that here in this collection of Renaissance-era letters we meet the mind of Tolomei (1492–1555), a Humanist poet, diplomat, philologist, literary critic, and Catholic bishop. He counted among his many correspondents such notables as Anibal Caro, King Francis I, Aretino, Paolo Manuzio, Girolamo Ruscelli, and Bernardino Ochino; and among the women of his era Giulia Gonzaga, Vittoria Farnese, Camilla Saracini, Catherine de' Medici, Lavinia Sanvitale, Countess Olimpia Tolomei, and the Archduchess Margaret of Austria (1480–1530). Topics found in this collection of correspondence are wide ranging: Dante and terze rime, poetic style, preference for the Tuscan dialect, the fountains and viaducts of Rome, proper use of honorifics in letters, the letter “H” in Tuscan Italian and whether it is aspirated or not, teaching the alphabet to beginners, how a prince should react to those who speak ill of him, and the use of Greek words and terms. This edition “con nuova aggiunta ristampati, & con somma diligenza da molti errori corretti” is printed in italic, and divided into seven “books,” each “book” beginning with a woodcut factotum initial. The printer's handsome woodcut device graces the title-page and the volume ends with three useful indices. Provenance: Black-stamped supra-libros (faded to “silver”) of Paulus von Pruan (1548–1616), the Nuremberg merchant and collector, and his signature on the front free endpaper; most recently in the library of American collector Albert A. Howard, small booklabel (“AHA”) at rear. Hebrew Scholarship Tychsen, Oluf Gerhard. Tentamen de variis codicum Hebraicorum vet. test. mss. generibus, a Judaeis et Non-Judaeis descriptis: Eorum in classes certas distributione et antiquitatis et bonitatis characteribus. Rostochii: Impensis Io. Christ. Koppii, 1772. 8vo (18.2 cm, 7.1"). 372 pp.  First edition: Old Testament textual criticism and exegesis, written by a well-regarded German Orientalist, scholar of Hebrew, and professor at the University of Rostock. The text is in Latin with extensive Hebrew sections, and some quotations in Greek and German; the colophon gives Rostochii, ex officina Mulleriana. The JOYS of Hard Work in a Deluxe Edition Van Dyke, Henry. The toiling of Felix. New York: Charles Scribner's Sons, 1913. 8vo (22 cm, 8.6"). , 70 pp. ; 4 col. plts. (incl. in pagination).  First illustrated edition of this poem — based on the lines “Raise the stone, and thou shalt find me; cleave the wood, and there am I” — about finding Christ through selfless manual labor. Printed on heavy, deckle-edged paper within wide Art Nouveau-style borders, the text is additionally decorated with mounted chromolithographed painted illustrations by Herbert Moore. Signed binding: Publisher's deep violet-blue cloth, front cover with wide gilt border of floral and vine design, spine with gilt-stamped title and fleurons. Signed “EE,” with the second E reversed: Edward B. Edwards, who also designed the interior frames. NOT Mexico City Vázquez Gastelú, Antonio. Arte de lengua mexicana ... corregido ... por el Br. D. Antonio de Olmedo y Torre. Puebla: por Diego Fernãdez Leon y por su original en la Impr. de Francisco Xavier de Morales y Salazar, 1726. Small 4to (19 cm, 7.5"). , 54 [i.e., 53] ff.  An uncommon and significant work on the language of the Aztecs and other speakers of Nahuatl; Vázquez, a native of Puebla, was a professor of the “Mexican language” (i.e., Nahuatl) at the Royal College of San Juan and San Pedro and his local “take” is discernible here. This is the third edition, the first having appeared in 1689 and a second in 1693; a third edition of 1716 is listed in several bibliographies, but it is a ghost: (The “2” in the date of this 1726 edition is often indistinct on the title-page, causing some to read it as “1716”). Provenance: 19th-century signature “Torres” on recto of the front free endpaper, and in another 19th-century hand, “C.M. Puebla” on verso. Uncommon Spanish-Language Edition Vertot, René Aubert de. Historia de las revoluciones de Portugal, escrita en Frances...y traducida en lengua Castellana. Primera edicion. Leon de Francia: Hermanos De Ville, 1747. 12mo (17.2 cm, 6.75"). vii, , 372, [14 (index)] pp.  First Spanish edition of this important Portuguese history by the Abbé de Vertot, focusing on the 1640 revolution in which the "Spanish captivity" was ended and the house of Braganza brought to power. Jefferson's library contained a copy in the original French, and, following its first printing in that language in 1689, the work was translated into a number of other tongues, with the present Spanish rendition being now significantly less common than most others. Provenance: With the armorial bookplate of D. Feliciano Ramirez de Arellano, Marqués de la Fuensanta del Valle, and bookseller's ticket from a Lisboa dealer. Romantic Moonlit Cloth Binding Weyman, Stanley J. Sophia: A romance. New York: Longmans, Green, & Co., 1900. 12mo (18.9 cm, 7.5"). viii, , 345, [25 (adv.)] pp. ; 12 plts. This romance is illustrated with 12 black and white plates (including the frontispiece) by productive English illustrator Christine “Chris” Hammond. Stanley J. Weyman's stories were immensely popular during his day (1855–1928), but they are now often forgotten among other Victorian works. This is a first American edition, published one year after the London first. Binding: Publisher's navy cloth with gilt lettering to spine. On front board, gilt lettering and a moonlit water scene stamped in light blue, black, and white. Top edge gilt. Provenance: On the front free endpaper, the name-stamp of Sarah E. Lembeck, with her initials also written in pencil and stamped in ink. Did We Learn Papermaking from Insects? — ILLUSTRATED Who was the first paper-maker? London: T. Nelson & Sons, 1874. 16mo (16.3 cm, 6.4"). Chromo. frontis., 72 pp.  Charming discussion between father and son: the father claims wasps were the first true papermakers and shows the overall importance of natural history within a 19th-century boy's education. Text has a chromolithographic frontispiece of a wasp nest and a number of uncolored wood-engraved illustrations in text, some near full-page. Binding: Maroon publisher's cloth, colored paper onlay with title and illustration of wasps on a flower surrounded by ruled, foliate border stamped in black on front cover; blind border on back. Provenance: Faintly inscribed on front free endpaper in ink to Frank Y. Lewis from “a friend and Teacher,” Rettie Wright, 26 June 1876. “Frank Lewis” written on back endpaper in pencil. Most recently in the children's book collection of Albert A. Howard, small booklabel (“AHA”) at rear.